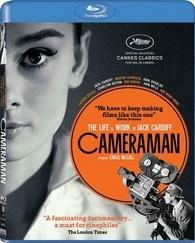 The acclaimed film featuring the renowned cinematographer is coming to Blu-ray in August. In an early announcement to retailers, Strand Releasing will release the documentary 'Cameraman: The Life & Work of Jack Cardiff' on Blu-ray on August 9. A star-studded documentary about one of the greatest Oscar®-winning cinematographers to capture the beauty of such stars as Marilyn Monroe, Audrey Hepburn and Sophia Loren in such memorable classics as 'The African Queen,' 'The Red Shoes,' 'Barefoot Contessa' and 'Black Narcissus.' With a career spanning more than 80 years, this passionate documentary reveals the craft of one of cinema's most indelible image-makers, Jack Cardiff. Specs have yet to be revealed, but supplements will include Interview with Craig McCall by Ian Christie, Jack's Actress Portraits, Jack's Behind-the-Scenes Movies, Cinematographer and Director Relationship, Working with Three-Strip Technicolor, Photo Galleries, Original Theatrical Trailer, and Other Strand Releasing Trailers. You can find the latest specs for 'Cameraman: The Life & Work of Jack Cardiff' linked from our Blu-ray Release Schedule, where it's indexed under August 9.